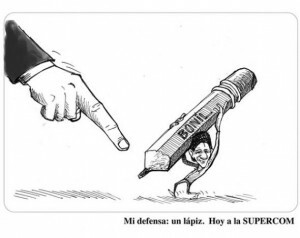 Political cartoonist Xavier Bonilla, known as Bonil, has been charged with “socioeconomic discrimination” in his home country of Ecuador for a cartoon targeting Agustín “Tin” Delgado, a former professional soccer player who now sits on Ecuador’s legislative assembly. Bonilla is best known for his outspoken and blunt political cartoons, which address several social and political issues within Ecuador. From his “insulting” cartoon of Ecuadorian President Rafael Correa (for which he narrowly avoided prosecution) to a controversial cartoon that depicted the raid of oil trade unionist and legislative adviser Fernando Villavicencio (a cartoon he was forced to revise within 72 hours of its publication), Bonil is no stranger to governmental censorship and he has been targeted by numerous social and political groups. Regardless, he has also become one of the most outspoken critics of the increased free speech violations in his home country. Freedom of expression here is permanently at risk. Cartoons represent a satirical and humorous take on all things that happen in public life. It’s part of debate in societies that are democratic, modern and civilized. The public identify with a cartoons through their humour, and often humour represents a chance for a sort of revenge. When there is an excessive power, the normal citizen can see in a cartoon, in comedy, or in a TV sketch, that they have been defended. Because the power has been ‘censored’, morally censored, because a cartoon is an imaginary triumph against the powerful, the abusive, the arrogant, the corrupt. [P]reparing him for the obligation to correct and improve his practices for the plain and efficient exercise of the right to communication, and compels him to abstain from repeating these acts that are at odds with the Law of Communication. You cannot fight against racial discrimination with a knee jerk decision like this. It is a small gesture that has been made with this resolution for the Afro community, making it so that an Afro public employee cannot be criticized. It is a tragic resolution and a terrible message for the national and international community. In response to the accusations, sympathizers have used social media and public protests to express support for Bonil. Similar to messages of solidarity for Charlie Hebdo supporters have dubbed their movement #YoSoyBonil (“I am Bonil”). The ludicrous allegations against Bonil are the latest example of the Ecuadorian government’s ongoing effort to stifle the country’s independent media… Freedom House reiterates its call for the Ecuadorian government to respect the fundamental right to freedom of expression and end its politically motivated persecution of journalists like Bonil. To punish a cartoonist is just like silencing a citizen. It is to prevent an individual from expressing his views peacefully…. Any kind of censorship, whether imposed in a coercive way, or self-imposed for fear of retaliation, should be reported, as it is a clear violation of freedom of expression.